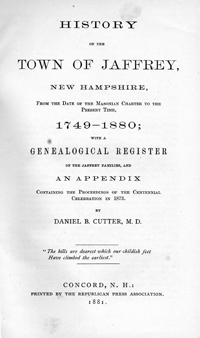 Cutter's History of of the Town of Jaffrey…1749-1880 was the first history of Jaffrey to appear in book form. CHAPTER II. Masonian Proprietors—Grant of the Township— Survey—Report of the Surveyor. CHAPTER III. First Settlers—Report of Gilmore, Grout, and Hale. CHAPTER IV. Municipal History—Charter of the Town— Incorporation—List of Town and State Officers. CHAPTER V. Travel—Highway—County Road—Third New Hampshire Turnpike—Monadnock Railroad. List of College Graduates of the Town of Jaffrey. Revolution—War of I8I2—Mexican War—Civil War. Miscellany—Hotels—Stores—Post—Office—Mail Stage—Banks—Sacred Music— Common—Sale of the Public Lands—Constitutional Convention-Delegates—Fires. Invoice, 1793, First on Record—Money Raised—Highest Tax-Payers. Pauperism—Warning from Town—Board of the Poor sold at Public Vendue—Town Farm. Cemeteries—Accidental Deaths—List of Persons whose Age exceeds Eighty years. Census of the Town, 1873, with the Location of the Inhabitants. Author: Daniel B. Cutter, M.D. Publisher: Printed by the Republican Press Association.